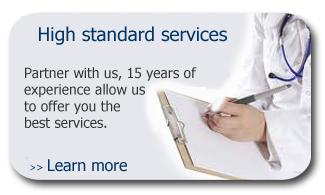 Setting up and conducting Clinical Trials involve a high degree of complexity. The elements producing such complexity vary according to the region and the country where the clinical trial will take place. 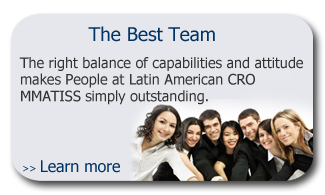 You are invited to use the knowledge of Latin American CRO MMATISS to successfully manage such complexity in a manner that will allow you to save time and resources. Employ the knowledge of Latin American CRO MMATISS to guide you in the design of the documents of the study, including Protocols, Investigator Brochures, Informed Consent Forms, Case Report Forms and Study Reports among others. When providing orientation in document development, in addition to considering ICH requirements, it is important to consider the internal dynamics of local sites and the particularities of local health professionals as well as the explicit and not explicit expectations of local ethics committees and ministries of health. 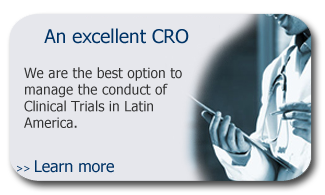 Latin American CRO MMATISS gladly offers customers with orientation in regulatory affairs, during clinical development phases, during the preparation for the drug approval submission and during post-marketing activities. Please feel free to contact us any time if you consider that the expertise and knowledge of Latin American CRO MMATISS might be helpful for you to reach your goals. We’ll be glad to help you get in touch with the associates that will better provide you with the kind of orientation you require.